A lot of people may not find it a big deal when they hear that it is now possible to use Bitcoin as a form of payment for investing in US securities issued using the new exemptions Regulation Crowdfunding or Regulation A+ that allow companies to raise capital from the general public. After all, haven’t people been using Bitcoin to buy everything from pizza to tokens in an ICO for years now? However, these people may be missing something of vital importance: these two regulations require investments to be placed into escrow managed by a qualified intermediary. In layman’s terms, this means you need a bank that is willing to receive the Bitcoin payment and hold it in trust until the transaction meets the regulatory requirements and is then disbursed to the company selling the securities. Let’s look into this a little further. Until now, there were no banks who were willing to act as a custodian of digital assets. Prime Trust, which is a Nevada-based trust company (which is a bank), agreed to be the first institution of its kind to permit the custody of cryptocurrencies, including Bitcoin. Prime Trust’s CEO Scott Purcell is an innovator and a banker with the ambition to be the regulated plumbing for enabling transactions in the crowdfunding and ICO world. In fact, Prime Trust recently announced a partnership with IBM for a new stable coin, in which Prime Trust will be responsible for holding the capital backing the new stable coin called USD Anchor. Bitcoin, the largest cryptocurrency, is now accepted for Regulation Crowdfunding. So why is it a big deal that a bank wants to hold cryptocurrencies in trust? Simple. One of biggest hurdles for any company handling Bitcoin is the risk that the handler can be hacked, in which case the investor loses all of their money. Think of Mt Gox and the dozens of websites or “exchanges” that were hacked. They had no custodian of the assets and no insurance, so when they were hacked, the Bitcoin was gone. End of story. With Prime Trust, the game has changed. The investor can rest assured that their Bitcoin in trust is FDIC-insured because it is received into the bank’s custody and then eventually converted into US dollars. This is the first time a bank is guaranteeing the safety of Bitcoins. No one has ever done that. Yes, the so-called exchanges have been saying, and will say, they are keeping Bitcoin safe in cold storage, but ultimately they are not a bank. There is no FDIC insurance, which insures deposits of up to $250,000 in a single bank (if an investor wanted to deposit more than that amount, it would have to be split among more than one bank). Prime Trust has innovated and broken the necessary barrier to growing the cryptocurrency marketplace by providing this investor protection. Let’s explore the benefits of this new solution. Regulation Crowdfunding is one of the most promising forms of raising capital for companies in the United States. It can be used for ICOs or more traditional crowdfunding structures. 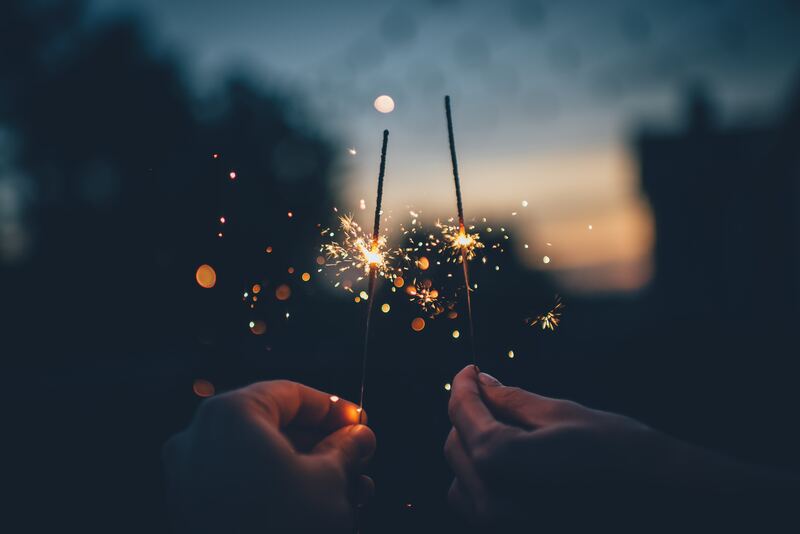 The StartEngine Index (full disclosure: I am the co-founder & CEO at StartEngine) shows a nascent marketplace helping hundreds and soon to be thousands of companies raise capital for their businesses. The regulation as published by the SEC requires the funding portal, such as WeFunder, StartEngine or SeedInvest, to use a qualified intermediary or bank to hold the investor funds in escrow until the company raising capital on that portal has successfully met its minimum investment. Until today, none of the funding portals have been able to legally accept Bitcoin as a form of payment because no escrow was able to take it. This is no longer the case now that Prime Trust is accepting Bitcoin. 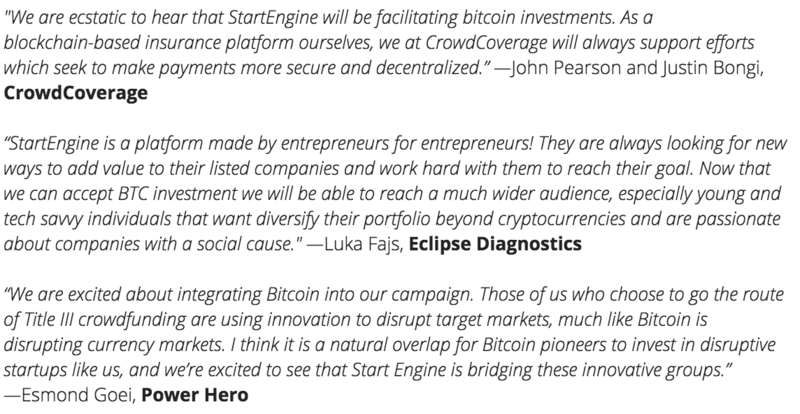 Funding portals like StartEngine have now announced their support for Bitcoin, which will mean companies can raise capital through Bitcoin on a funding portal and raise up to $1.70M per year. This amount may not seem big, but it is significant because it is legal. A company can now sell tokens to the general public accepting Bitcoin in return and can simultaneously raise capital using Regulation D 506(c) to sell above the $1.07M limit to accredited investors. Voilà. ICOs are being brought out of the shadows into a regulated marketplace thanks to the JOBS Act and to innovators like Prime Trust. It is clear by now that cryptocurrencies and blockchain applications are going to revolutionize finance, as well as other industries, but it is also obvious that this must be, and can only be, done by following the established regulations and laws in the United States. With Bitcoin now an accepted payment for Regulation Crowdfunding, the JOBS Act and the blockchain community continue to come closer together. The future is bright for a total disruption of the finance industry.